We feel that our crew is one of the things that separates us from other whale watch companies. We are all true whale watch specialists and love what we do. Ask around, you will not find a more qualified, experienced and enthusiastic crew! Pete began boating at the age of six weeks, when his parents took him for his first sail. Growing up, he spent his summers exploring the eastern seaboard from the Bahamas to Nova Scotia. Pete began tagging along on whale watches when he was twelve, and started working as a deckhand a couple of years later. At the age of nineteen, Pete obtained his captain's license, and has been taking the Granite State in search of whales every summer since. In 2005, Pete and his wife Lindsay purchased the business from company founder and thirty year veteran Leo Axtin. In the offseason, Pete loves backpacking and hiking in the White Mountains. Pete has a B.A. in Communications from the University of New Hampshire. Lindsay spends her summers managing the ticket office. You will find her there ready to answer your questions or help you with directions. While she doesn't get the chance to come out on the boat very often, she brings great luck when she does. When not at the harbor, Lindsay can be found at the barn, riding her 13 year-old Thoroughbred, Cody. And in the offseason, she's probably up in the White Mountains! Lindsay has a B.S. in Animal Science from the University of New Hampshire. This will be Melanie's fifteenth year with us on the Granite State. Melanie is our senior staff naturalist and is a research associate with the Blue Ocean Society. In the winter months, Melanie works as part of a whale research team that conducts aerial surveys of the Right Whale population off the coast of Florida. She holds a B.S. in Biology from Ursinus College. With 25 years of experience as a whale watch captain and naturalist, we are thrilled to have Jonathan on our team. He brings with him a wealth of knowledge about Jeffreys Ledge and the whales that frequent it. He is especially knowledgeable about the more remote areas of northern Jeffreys Ledge. In the winters, Jonathan also works as an aerial observer, conducting surveys of the endangered North Atlantic Right Whales populations in their southern breeding grounds. Jonathan obtained his 100 ton captain's license in 1997. He graduated from Roger Williams University in 1998 with a B.S. in Marine Biology. Dianna is a co-founder and the President of Blue Ocean Society. She also holds the titles of Research and Intern Coordinator. Dianna holds a Bachelor of Science degree in Zoology with a minor in Marine Biology from the University of New Hampshire. During her undergraduate career, she enjoyed two summers taking courses at the Shoals Marine Laboratory on Appledore Island. She also holds a US Coast Guard captain’s license for 100-ton vessels. Dianna has over 15 years of experience in the field of marine science and education including serving as naturalist and research scientist aboard commercial whale watch boats in NH and MA. She implemented Blue Ocean Society’s research and education internship program in 2000, and has given many presentations to schools and groups pertaining to the marine environment. 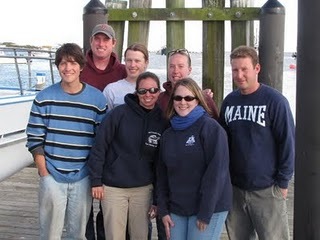 Katie has been with Granite State Whale Watch for many years and has led over a thousand whale watches. As an experienced whale researcher, there aren't many questions that Katie can't answer. Katie is also a seasoned boat operator, and holds a 100 ton captains license. Katie is a research associate of the Blue Ocean Society. When not on the Granite State, she is busy spending time with her three children. She graduated from the University of New Hampshire in 1993 with a B.S. in Marine and Freshwater Biology, and obtained her Masters in Education there in 1997.